If you are in NYC on December 4th and 5th, we’d love to see you at either one or both of the book launch events that we have scheduled. 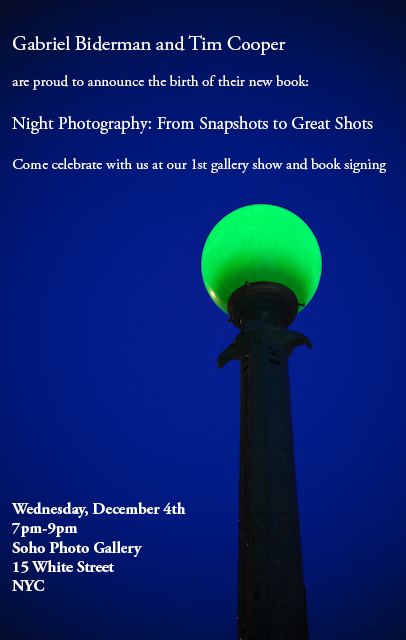 The first “party” will be a gallery show/book signing on December 4th at the Soho Photo Gallery. You’ll be able to bring your book to get signed, as well as purchase one if you haven’t already. Tim and I will have 15 of our images printed on aluminum for your viewing pleasure. Dress up, as you will have the opportunity to get your portrait taken by the legendary Cliff Hausner, who will be running a photo booth at the event as well! On December 5th, Tim and I will be speaking at the B&H Event Space from 6pm-8pm. We are going to take a closer look at our photographs that were shot in a variety of nocturnal environments. We will go into the details of how the photos were created, share our techniques, and hopefully inspire you to take better images once the sun goes down! Register for the seminar here. If the event is sold out – come anyway; just arrive 15-20 minutes early as you can generally get in on the wait list. 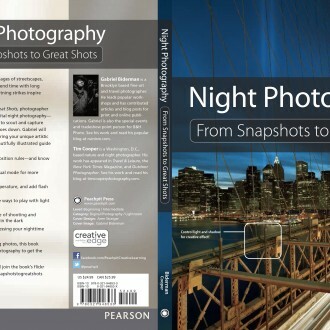 Night Photography: From Snapshots to Great Shots is now in stock at Amazon and Peachpit Press. Amazon is offering their Kindle version and Peachpit has an open format Ebook if you’d like a digital version. The best way you can support me is by purchasing the book via one of the links I have set up here. I would also like to also encourage those of you who own the book to take the time to write a review on Amazon – I appreciate the feedback and support. I hope to thank you in person at one of these events! Congratulations for your new book, looking forward to buy it. Congratulations, what a fantastic achievement. Sorry we can’t be with you for the launch but I will definitely be buying a copy.